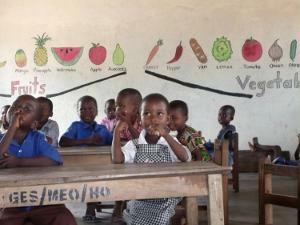 Ghanaian children in school aided by DIVOG. When it comes to charities serving beleaguered Africa we are inundated by the staggering numbers of Western non-governmental organizations that are constantly popping up to do so. Unfortunately, only a few are genuine enough to be lauded. Yet rarely do we hear about indigenous NGOs that heed the calling of Africans doing it for themselves. We seldom hear about young African men who are successfully taking up the call of self-reliance, such as Disaster Volunteers of Ghana, DIVOG. DIVOG is a grassroots non-profit organization that is investing in the futures of children, community by community on an almost non-existent budget. The volunteering organization, which is based in the capital of Ghana’s Volta Region, Ho, receives no funds from financial institutions or donor organizations. The fees that volunteers pay to work on building projects and to a lesser extent, funds from philanthropists, are the organization’s only sources of income. DIVOG recruits international volunteers and community members to build schools, orphanages, outdoor washrooms and safe drinking water facilities in some of the most deprived rural communities. DIVOG was founded by the Voltarian, Richard Kwashie Yinkah, in 1997 with the vision of “ensuring all Ghanaian children have access to quality education in safe buildings that are conducive to learning.” He is achieving this by starting in Volta Region’s rural communities. Although school projects are the organization’s primary focus, DIVOG also seeks volunteers and equipment for medical facilities “because there’s no point in providing classrooms when children are too sick to sit in them,” says Kwashie, the founder and CEO. No commercials or advertisements about DIVOG are seen. Its skeletal budget cannot afford such expenses, but also because the organization operates from the premise that its meagre funds should be channeled towards projects for the impoverished communities that it serves. This practice, unlike that of the majority of non-profits whose administration budgets far exceed the amount of money that is actually spent providing service, sets DIVOG apart from others. Since the organization was established in 2002, four other young Voltarian men have embarked with Kwashie on the mission. But the DIVOG mission is no small feat in a country that as recently as 2010, Forbes International ranked as having the 9th worst economy of the world. Ghana’s per capita income is US$621, which is not much of an improvement from the $360 it was when the country became independent March 1957. The numbers are even more disappointing if compared to Malaysia, which gained its independence five months after Ghana. Ghana, like many African countries, is rich with diverse natural resources and from independence has had the potential to alleviate much of the poverty that is ravaging its people. The country exports a variety of minerals, including gold and diamonds; its agriculture sector sustains 59 per cent of the employed population in the production of a variety of produce including coconuts, cashew, pineapples, shea nuts, palm oil, coffee and cocoa. In 1978 Ghana was the world’s top cocoa producer. Poor governance and corruption, and not the lack of resources, have contributed to the country’s close to 30 per cent poverty level, as reported by the CIA Fact Book (local authorities would place the number closer to 50 per cent). In 2001, 46 per cent of Ghana’s budget was supplemented with foreign aid. It is no surprise that the IMF reported “Ghana’s problems were mostly home-grown… Ghana was a typical example of the world’s worst-managed economies. It’s a country that shouldn’t be poor, but it is.” It is also not surprising that people feeling the worst side effects of the poor management of Ghana’s resources are in the rural areas, such as those of the Volta Region. Almost 79 per cent of the Volta Region’s population lives in its rural communities. The Volta Region is in south eastern Ghana, and shares a border with Togo. The majority of the people are self-employed in farming, fishing or petty trade. In the words of a former Speaker of Parliament, Peter Ala Adjetey, Voltarians, like the rest of Ghanaians are “eking out an existence, a life of wretched poverty or what the poet describes as ‘chill penury’” to earn much less than a $1. In the 2000 census seven-year-old children had to be considered for questions pertaining to the region’s economic activity due to the reality of their economic contributions in households. In the past, the eligible age for census participation was 15. Statistics also show that the high level of child labour in the Volta Region, is directly related to the 59 per cent drop of primary school-aged children attending middle school from 23 per cent in the former census. It was also reported that the lack of new middle school infrastructures in the majority of rural areas also contributed to the low number of eligible students attending middle school. It is such direct results of the poor management of Ghana’s economy that makes it vital for DIVOG to ensure every penny it gets is well managed. 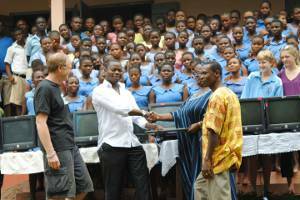 DIVOG founder and CEO, Richard Kwashie Yinkah at a ceremony with volunteers, officials and pupils. He is of the mindset that the financial constraints force the organization to use its work to talk for itself. DIVOG depends primarily on the word of past volunteers to promote the organization. Angelbert Ankah, the organization’s Director of IT/Construction explained, “this means DIVOG must always be transparent and constantly deliver.” The philosophy and word-of-mouth advertising is working for DIVOG. On January 26th, 2011 a fundraiser will be held at Lula Lounge, Toronto, on behalf of Disaster Volunteers of Ghana. Proceeds from the fundraiser are for DIVOG to build outdoor washrooms for school facilities in the village of Biakpa in Ho Municipality, and to purchase supplies for local orphanages and schools. The fundraiser is organized by a group of DIVOG volunteers who will be travelling to Ghana from Canada and the US in February to help build the washrooms and volunteer at the schools and orgphanages. This is not the first time that some of these women are coming to DIVOG’s aid. Not only are the women returning to Volta Region in February to help DIVOG with the school building project, but they have recruited other volunteers to fundraise and work on building one of the schools. One of the volunteers who is returning to work with DIVOG stated, “We have attracted others to come because of our belief in DIVOG. These women trust us and in turn, we know what can be accomplished by working with DIVOG. We will leave feeling that we accomplished something small there, something larger when we leave and something lasting with our acceptance and belonging in their community. For further information on Disaster Volunteers of Ghana, or to volunteer and donate to the organization go to www.divog.org.